A couple of weeks ago, we wrote an article about the Mercedes-Benz Auto 2000 concept that was presented to the public at the 1981 edition of the Frankfurt Motor Show. 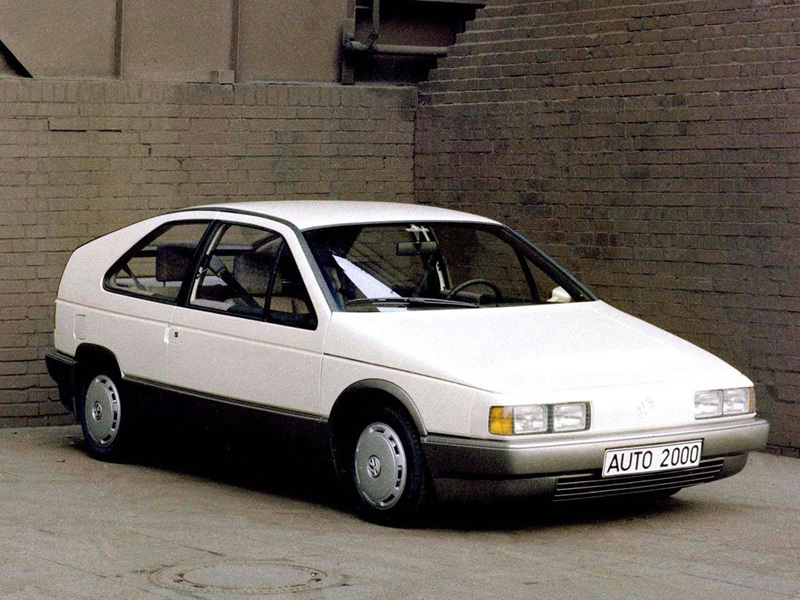 The Auto 2000 project started in 1980 when West Germany’s Federal Ministry for Research and Technology challenged local automakers to design a fully-functional prototype that was considerably more fuel-efficient than what was on the market at the time. The project’s guidelines specified the prototypes had to use no more than 9.5 liters of gas per 100 kilometers (24.7 mpg US / 29.7 mpg UK) if they weighed between 1,250 and 1,700 kilos (2,755 and 3,747 pounds) and no more than 11 liters per 100 kilometers (21.3 mpg US / 25.6 mpg) if they tipped the scale between 1,701 and 2,150 kilos (4,739 pounds). The guidelines also specified that the prototypes had to be able to comfortably carry four adults and 400 kilos (881 pounds) of luggage, while performance, size and reliability had to be at least on par with similarly-sized cars sold new at the time. The Federal Ministry for Research and Technology invested 110 million Deutschmarks to help fund the project. Mercedes wasn’t the only West German automaker that participated in the project: Volkswagen introduced its take on what form a futuristic, highly fuel-efficient car should look like at the 1981 Frankfurt Motor Show. Riding on a modified Golf platform, the Auto 2000 boasted tall, fastback-like silhouette with a wide C-pillar, a glass hatch and a truncated rear end. Up front, the radiator grille was replaced by a sizable air dam discreetly integrated into the bumper, while 13-inch steel wheels fitted with full wheel covers reduced drag. The Auto 2000 stretched 157 inches (401 centimeters) long, 65 inches (167 centimeters) wide and 53 inches (135 centimeters) tall, dimensions that made it roughly the same size all around as a second-generation Scirocco. It tipped the scale at 1,719 pounds (780 kilos) thanks to the use of lightweight materials. Inside, the Auto 2000 featured a typically Teutonic function-over-form dashboard that was visibly inspired by other members of Volkswagen’s early-1980s lineup. The analog instrument cluster was replaced by an innovative digital unit. The Auto 2000 could be fitted with one of three engines. The first prototype was powered by a 1.2-liter three-cylinder turbocharged three-cylinder engine that generated 53 horsepower and 72 lb-ft. of torque, enough to send the car from zero to 62 mph (100 km/h) in 18.2 seconds and on to a top speed of 100 mph (161 km/h). A supercharged version of the oil burner made 60 horsepower and 86 lb-ft. of torque, cutting the time required to hit 62 to 15.8 seconds and raising the top speed to 115 mph (186 km/h). The two diesel engines spun the front wheels via a 4+E gearbox, which was essentially a five-speed unit with a long 5th designed for to keep the engine’s rpms low. The third engine was a gasoline-burning 1.0-liter four-cylinder unit fed with a supercharger. It transferred 75 horsepower and 78 lb-ft. of torque to the front wheels via a four-speed automatic that featured a freewheel function. Fuel economy was kept in check thanks in part to a low drag coefficient of 0.25. Both diesel engines came with a novel start-stop system that automatically shut off the engine when it idled for over two seconds and turned it back on when the gear lever was moved. The system was later made available on several members of the Volkswagen lineup including the second-generation Polo (see our review here). The most efficient version was the turbocharged diesel, which returned 56 mpg (4.2 liters per 100 kilometers / 67 mpg UK) in a mixed European cycle and gave the Auto 2000 a total driving range of 870 miles (1,400 kilometers). The supercharged mill was rated at 51 mpg (4.6 liters per 100 kliometers / 61 mpg UK) and the gas-burner returned 29.7 mpg (7.9 liters per 100 kilometers / 35.7 mpg UK). The Volkswagen Auto 2000 concept remained a design study that was never seriously considered for mass production by the automaker’s top brass. However, the third-generation Passat that was introduced in 1988 borrowed several styling cues from the futuristic show car. Photos and technical specifications kindly provided by Volkswagen’s archives department. Previous post ← Is the Suzuki Cappuccino a future classic? Gen 3 Volkswagen Passat in the front, Pontiac Aztek in the back. yes i think you are right. i still think the car would have sold if vw had desided to produce it.